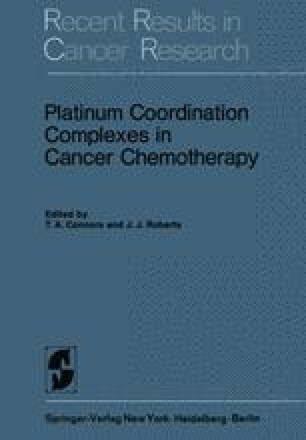 The emphasis which should be put on material for the Co-ordination Chemistry Section is open to individual interpretation, and for this presentation the major theme is the relationship between the chemical structure and properties of the compounds and their anti-tumour activities (i. e. Structure—Activity Relationships). There is some overlap with Session II and several papers could have been presented in either section. The intention is to summarise briefly the known relationships and existing data, and then to discuss research which is at present in progress as described in the submitted papers. Where possible an attempt is made to indicate areas which might usefully be pursued for gaining a better understanding of this new and fascinating area of inorganic research. It should be pointed out that this Session also contains papers which discuss transition metals other than platinum.